Best grown in areas with long warm summers. Generally will not produce a good crop of peanuts north of Virginia. Plant seeds in spring after ground has warmed. Best grown in well-composted, fertile, light-textured, sandy, well-drained soils in full sun. Add calcium as needed to the top 3-4” of soil. Do not allow soils to dry out. Plant seeds (peanuts) about 2” deep in rows about 3 feet apart with 6-9” between each plant in the row. After first fall frost, plants are dug up, freed of soil and spread on a dry surface not touching the ground (sometimes plants are simply dug up and inverted on the ground) to cure before stripping the pods from the plants. Pods typically ripen 120-150 days after seed is planted. Arachis hypogaea, commonly known as peanut, is an herbaceous perennial that is raised as an annual. It typically grows in a single season to 10-20” tall and as wide. It somewhat resembles in appearance a small sweet pea bush. It is primarily grown as an agricultural crop for harvest of peanuts which have become a favorite food consumed world-wide by humans (raw nuts, peanut butter, oils and confections). Plants are native to South America. Opposite pinnate leaves have an even number of leaflets (each leaf usually has two opposite pairs with no terminal leaflet). Each leaflet is ovate-rounded to 2 1/2” long and 1” across. Pea-like orange-veined yellow flowers (to 1 5/8”) appear solitary or in small axillary clusters. Flowers bloom from July to September. After pollination of a flower, the flower stem elongates and dips until the ovary reaches the ground, at which point continued growth pushes the ovary into the ground where the fruit (peanut) develops into a legume seed pod, each pod to 3” long and containing 1-4 seeds. Unlike other legumes such as peas or beans, peanut pods do not split open when ripe to release seeds. From a botanical standpoint, peanuts are legumes not nuts. However, in most cases peanuts are served for human consumption as if they were nuts. Plants are commercially grown in the southeastern U.S. from Virginia to Florida and Texas, but have been introduced further north to Missouri, Kentucky, Pennsylvania and Massachusetts. Peanut was primarily used as animal feed stock until the 1930s. George Washington Carver helped develop the peanut while employed at the U.S. Department of Agriculture. USDA encouraged cotton farmers in the southeastern U.S. to grow peanuts as an alternative to or in addition to growing cotton, in part because cotton depletes nitrogen from the soil but peanuts add nitrogen to the soils (nitrogen fixing). Commercially, China produces about 42% of the overall world production followed by India at 12% and the USA at 8%. Genus name comes from Arachidna for a clover with recurving, subterranean, fruiting heads. Specific epithet means under the earth in reference to the subterranean development of peanut pods. No serious insect or disease problems. Peanuts are particularly susceptible to contamination during growth and storage. Poor storage can lead to infection by mold fungus Aspergillus flavus. 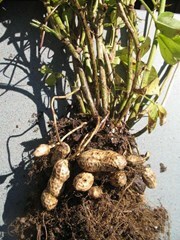 Peanuts are typically not grown in gardens as ornamental plants. Peanuts serve not only as a favorite food product for humans, but also are commercially used in the production of a number of non-food items such as textile materials, cosmetics, plastics, dyes and paints.